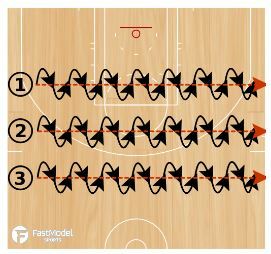 This ball handling drill was contributed by Rick Allison, Owner/Founder/Lead Trainer of LoneStar Basketball Academy to the FastModel Sports Basketball Plays and Drills Library. 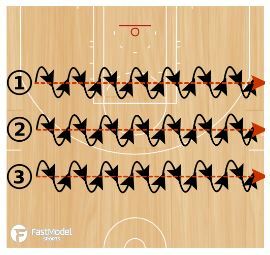 This is a training progression for one or more players to improve their ball handling transitions from one or more crossovers into a spin crossover. 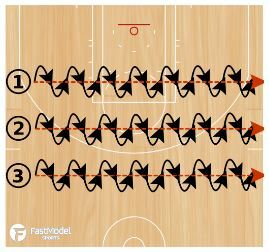 It begins with a simple front cross into spin crossover and progresses to more challenging combinations and permutations as the player develops more confidence and dexterity. 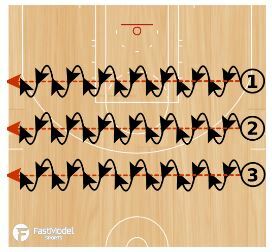 Alternating dominant and non-dominant hands are incorporated to facilitate movement across the court. 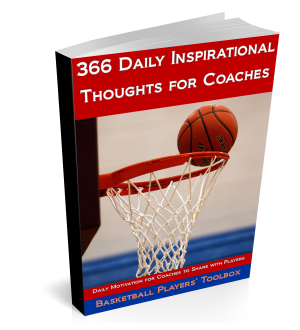 There are links to You Tube videos of the drill at the bottom of the post.